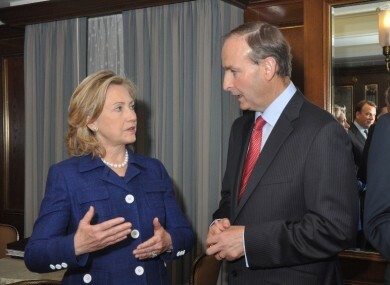 Hillary Clinton with Micheál Martin in September 2010. FIANNA FÁIL LEADER Micheál Martin has written a letter to the outgoing US Secretary of State Hillary Clinton as she concludes her time at the State Department. With US President Barack Obama being sworn in for a second term, Clinton’s long-expected departure will see her replaced by John Kerry in the coming weeks. As Minister for Foreign Affairs during the last years of the Fianna Fáil government Martin worked with Clinton on a number of occasions including a joint US-Ireland summit on hunger and malnutrition in New York in 2010. The letter also addresses Clinton’s “friendship, leadership encourage and advice” on issues related to Northern Ireland. “Given the events of recent weeks, engagement with and reconciliation between communities in Northern Ireland remains a key priority for all political parties,” Martin writes. He also expresses his desire and that of “many Irish people” to see her return to public office in the future. Email “In full: Micheál Martin’s letter to outgoing US Secretary of State Hillary Clinton”. Feedback on “In full: Micheál Martin’s letter to outgoing US Secretary of State Hillary Clinton”.